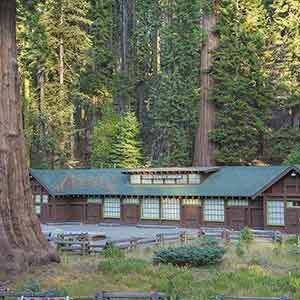 This hike starts in the low-elevation Belknap Camp grove, where sequoias grow among a row of creekside cabins. 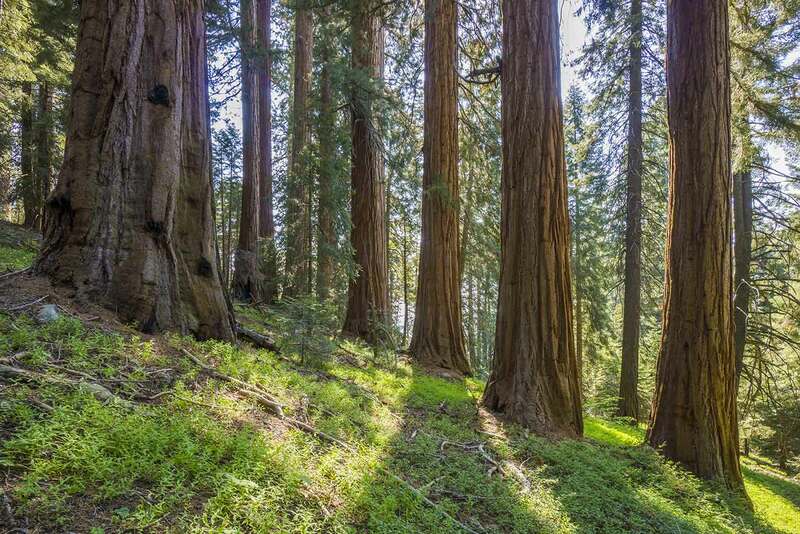 After a long and dificult climb, the hike ends at the top of McIntyre Grove, an otherworldly high-elevation grove with immense sequoias on a steep hillside. 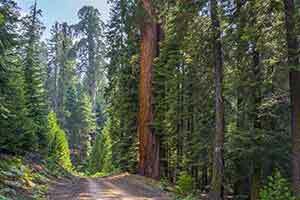 Although there’s only about three-quarters of a mile of trail in the upper grove, it’s the most scenic stretch of sequoias in Sequoia National Forest. 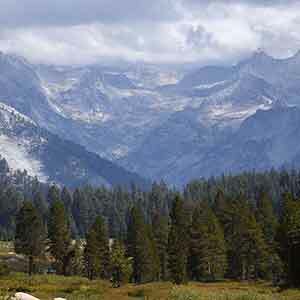 The high-elevation sequoias grow in a very open forest; in a few spots there’s no greenery at all beneath the canopy. Open sequoia groves tend to be the most scenic because you can see more. However, what really makes the grove otherworldly is that all the sequoias seem to be immense; there aren’t a lot of small sequoias except around the edges of the grove. Unusually for a National Forest, this part of the grove has never been logged. In addition, the grove is little-visited and feels very remote; the difficult two-hour hike each way ensures that, even on a summer weekend, you’ll probably have the trail to yourself. 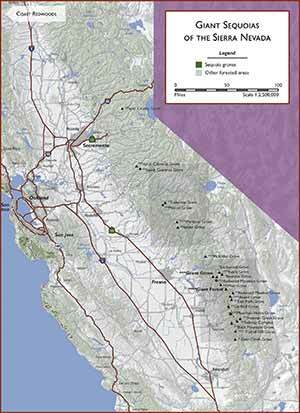 There are two routes to the upper McIntyre Grove: the Bear Creek Trail from Coy Flat and the Redwood Grove Trail from Belknap Camp. The Redwood Grove Trail is much more enjoyable; it’s shorter and easier, it doesn’t have any poison oak, and it’s more scenic. However, it’s not an official trail and can sometimes become hazardous or disappear altogether. The Coy Flat route, although narrow and overgrown, is more suitable for mountain biking. The hike starts just outside Belknap Campground. You can pay $5 to park within the campground and then walk to the end of the campground road to where an unnamed creekside path begins. However, if you drive past the campground, there are a few free parking spots on the side of the road; you can also park at the Nelson trailhead at the end of the road. In this case, take one of the driveways that’s not gated or marked “private” ; I usually take the one with the blue “McIntyre” sign, which descends from Camp Nelson Road to a group of cabins. At the end of the driveway, there’s a footbridge that leads to the creekside path. 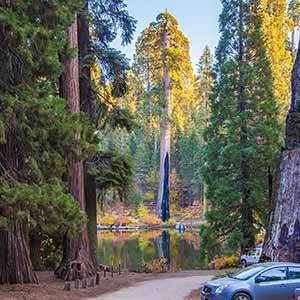 Belknap Campground is the only drive-in campground in an old-growth sequoia grove. The small but popular campground sits at the bottom of a stringer grove that lines the banks of the Tule River. 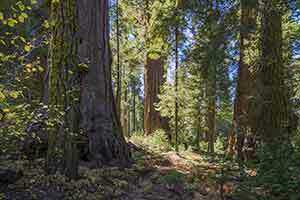 Several large sequoias grow within the camp, but the biggest sequoias by far are on the short creekside path just to the north, which provides access to a row of attractive private cabins along the river. 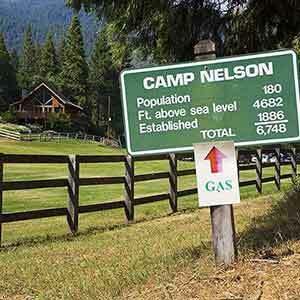 The cabins can only be reached by the footpath; there’s no road. 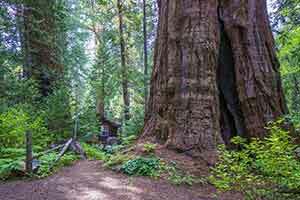 The first six cabins sit among strikingly large sequoias, the most impressive in the area; after that, the sequoias become smaller. The Redwood Grove Trail starts between two cabins just upstream of a big log bridge. It’s initially overgrown and hard to see, and as it begins a steep climb there are several fallen trees across the trail. After the first few yards the trail’s condition improves and for the rest of the way it’s easy to follow, if at times really steep. 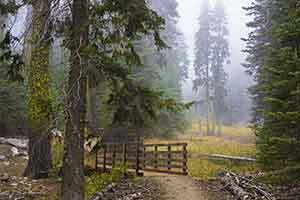 The trail climbs through a dense woodland of really small, scrublike pine trees with a few lodgepole pines. Unfortunately, despite all the climbing there aren’t any views. 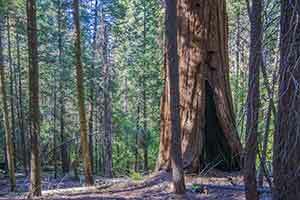 The woods open up a little but maintain some of the scrublike character as the trail enters a small sequoia grove. The trail levels out as it passes through the grove. 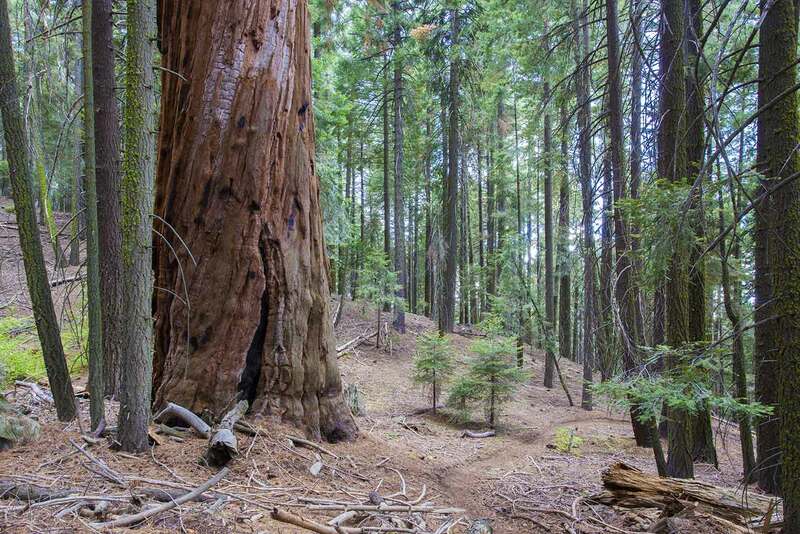 Although it doesn’t have a whole lot of sequoias, the grove has a grandeur and a beauty that’s missing in the neighboring sequoia-less areas. There’s a huge lone sequoia, and a few other isolated sequoias are visible before the trail leaves the grove and begins climbing again. 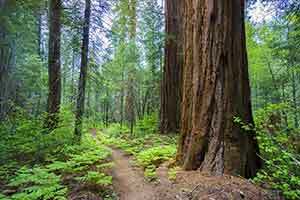 Above the intersection of the Redwood Grove and Bear Creek Trails, the trail again becomes wider and better-maintained, climbing through a dense forest of very small trees. 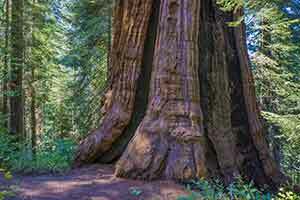 As the trail enters the upper McIntyre Grove, the woods open up and some huge sequoias appear. 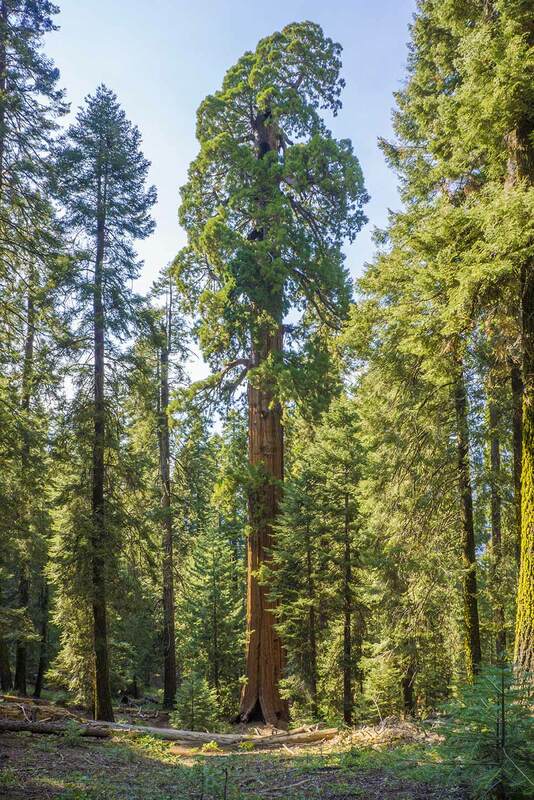 Most of the sequoias in the grove stand in isolation, and most of them are also gigantic. The trail climbs steeply up the hillside, winding among the monster trees. About halfway through the grove, the woods become even more open and scenic. Near the beginning of the grove, an especially large tree with huge branches stands within a switchback; from the trail there’s a good view of the tree’s massive crown. This might be the Patriarch Tree. 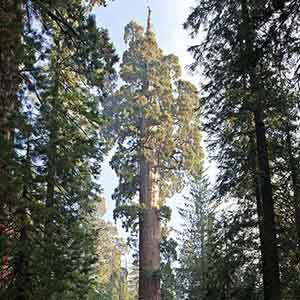 At the very top of the grove the trail passes through a relatively dense collection of smaller sequoias. 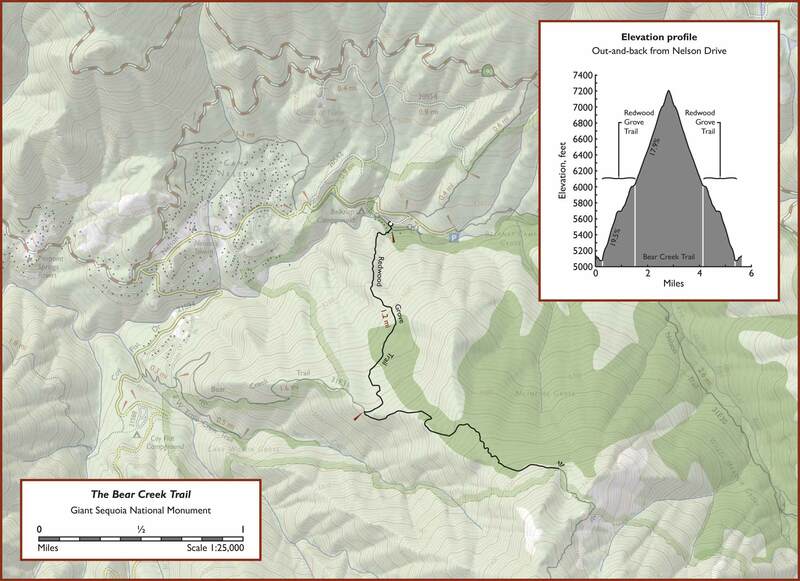 The suggested route ends just after the trail leaves the sequoias; however, the trail continues to the summit of Slate Mountain. As it leaves the sequoias, the trail starts to climb even more steeply than before, dispensing with switchbacks and going straight up the hillside. It also becomes rocky. It’s slow going on foot and would be very challenging on a mountain bike. The trail climbs through pine forest for a bit before breaking out into a much more open area dotted with glacial rocks and rock formations. Entering the woods again, it continues to climb and the woods become progressively more scenic. The trail then begins a gentle descent to a burbling little creek and some attractive meadows before the final climb to the summit. There aren’t really any views until the summit, but the area is very peaceful and scenic. 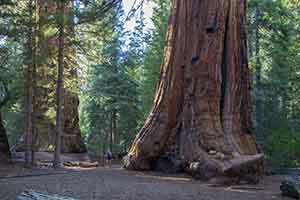 Sequoia Mountain Adventures, which offers a shuttle service for the trail, has a helpful page that describes current trail conditions.